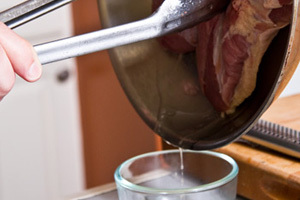 This post covers both rendering fat from duck breasts (before finishing with a sear) and (further below) rendering fat from duck trimmings. Ducks carry a significant portion of their fat near the surface of their skin where it provides warmth and buoyancy. This means that in order to get a moist, flavorful, and not over-fatty result when pan-roasting duck breasts, you need to render that fat first. Rendering duck fat is actually very easy, as long as you’re patient and use the right technique. A delightful side effect of the process is extra duck fat you can use in other dishes later (instead of butter or oil). Duck fat is almost universally considered to be one of the most flavorful cooking fats available, and is divine when used to roast heirloom potatoes! Scoring duck breast skin allows the fat to render out evenly, resulting in crisper skin, and moister meat. 1. If there are any sections of skin/surface fat that are significantly thicker than the rest, use a horizontal cut to trim them down. These trimmings can be saved and rendered down separately. 2. Draw the blade of the knife across the skin, cutting just deep enough to reach the meat without piercing it. Repeat across the surface of the breast every ½ inch or so. 3. Turn the breast and repeat, so you have a crosshatch pattern of 1/2 inch squares. 1. Get a thin layer of oil hot in a frying pan and lay the scored duck breasts in, skin side down. 2. Cook over low heat until most of the duck fat has rendered out (45mins to an hour). Periodically drain the excess fat collecting in the pan and save it for later dishes. Tip: Weighing the breasts down, perhaps with a smaller frying pan, will help all parts of the breast have more even contact with the pan surface, rendering out more of the fat. This video demonstrates how to render the fat from duck trimmings so it can be used as a cooking fat for other foods (we highly recommend potatoes!). This is great! I’ll have to try this. I have an old ice cube tray that I use to freeze rendered fat, which I then store frozen in ziplock baggies. Each cube is 2 tablespoons of fat, but you can make them half sized, as well.